●The surface is mildew resistant and static resistant, easy to clean with mild soap and water. ●Over 160 Degree wide viewing angle, fully black backed front projection screen with 1.2 gain matte white textured surface. and with extended operational longevity. 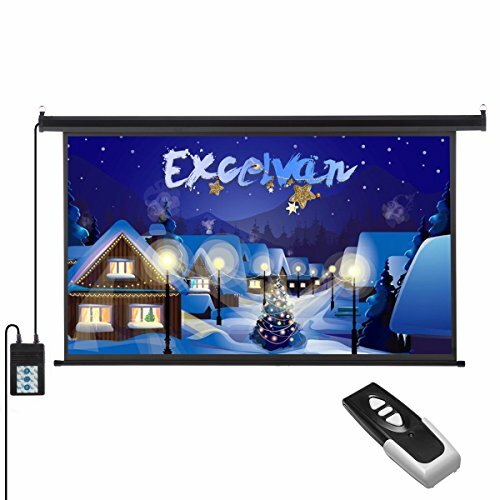 【Priority Warranty】: All Excelvan projector screens have 12 months warranty, 100% satisfaction and zero hassle returns guaranteed. 【Specification】: 16:9 Screen format and diagonal 120" offers 104.57" x 58.82" viewing area, over 160 Degree wide viewing angle. 【Auto Remote】: Includes Radio Frequency (RF) remotes, which is perfect for wall or ceiling installation with simple plug and play system. 【Convenience】: Wall mountable Prewired power cord with integrated switch to regulate drop/rise settings for use without remote control. 【Application】: Compatible with all projectors (4K, DLP, CRT, LCD, HD, 3D), ideal for business, education application, gaming, party, wedding, birthday, camping, meeting, conference, gathering, proposal, live broadcast, lectures, exhibition or residential uses.